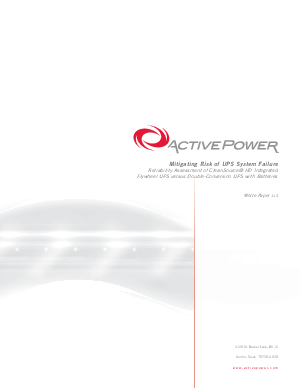 This paper provides a quantitative analysis of the in-service reliability of Active Power’s CleanSource 750HD UPS (uninterruptible power supply) system versus a double-conversion UPS with batteries. The study quantifies the likelihood of system failure during three different classes of failure – a long utility outage lasting more than 10 seconds, a short utility outage lasting less than 10 seconds, and a demand failure. The study also evaluates the probability of failure of CleanSource 750HD UPS with a secondary energy source and flywheel energy storage compared to a double-conversion UPS with batteries.